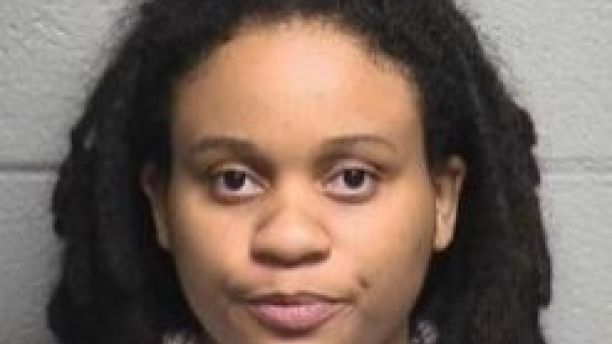 Deputies arrested a 22-year-old member of the far-left communist Workers World Party on Tuesday, Aug. 15, and charged her with vandalism for toppling a Confederate statue in Durham on Monday, Fox News reported. 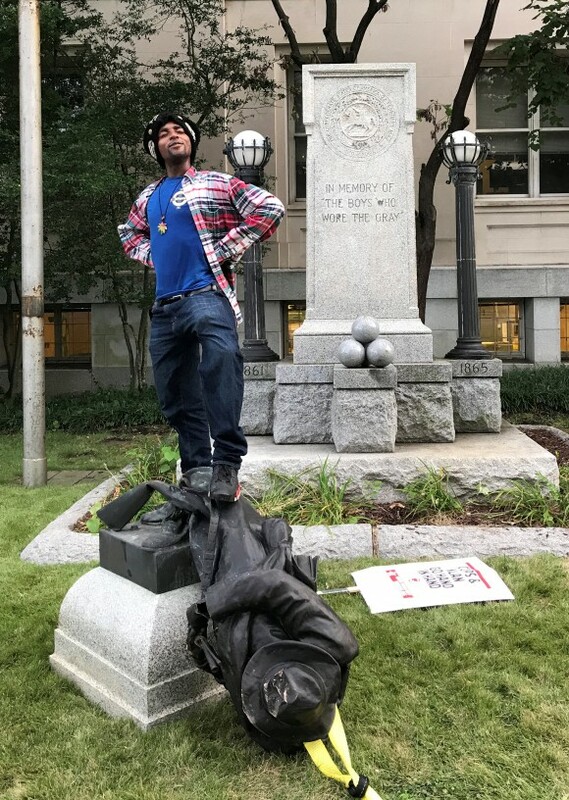 Takiya Fatima Thompson was seen bringing a ladder up to the Confederate Soldiers Monument in front of old courthouse as a crowd of rioters cheered. She then tied a rope around the nearly century-old statue to help topple it. Several rioters then proceeded to kick and stomp the downed bronze statue, which depicts a soldier with a rifle. The work was commissioned in 1929. Thompson, a college student, now faces charges for vandalism, property damage, and rioting, according to the Durham County Sheriff’s Office. Durham County Sheriff Mike Andrews said that he has identified several others involved in the vandalism and his deputies are now looking for the suspects to press criminal charges. “Let me be clear, no one is getting away with what happened. We will find the people responsible,” Andrews said on Tuesday afternoon. North Carolina’s Democratic governor likewise condemned the vandalism. “The racism and deadly violence in Charlottesville is unacceptable but there is a better way to remove these monuments,” Gov. Roy Copper wrote on Twitter. 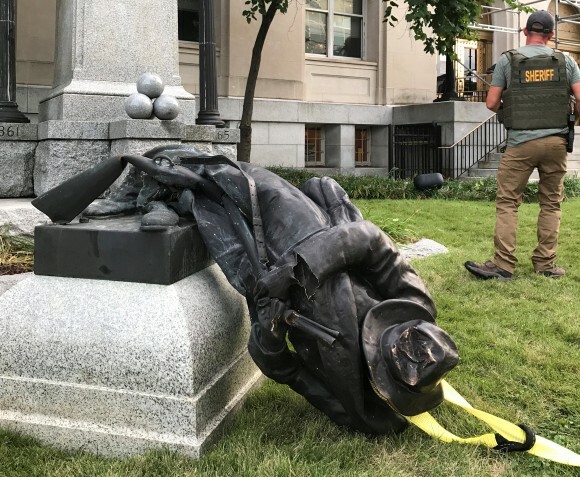 The toppling of the statue in Durham on Monday was triggered by events in Charlottesville on Friday and Saturday. Members of various groups, including white nationalists, and neo-Nazis, gathered to protest the removal of a Confederate statue there. 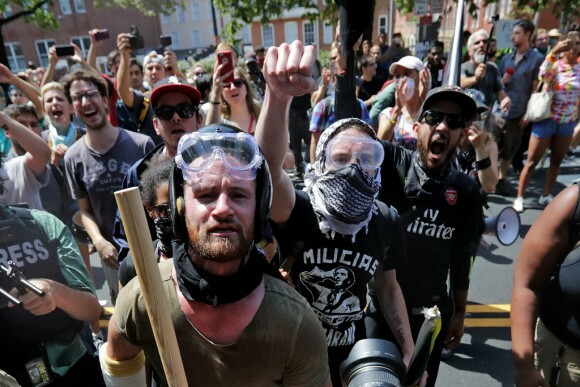 They were met with counterprotesters, some of whom were armed and violent members of the extremist Antifa organization. Clashes started on Friday and continued on Saturday, culminating in a car attack that killed one counterprotester and injured 19 others. The communist Workers World Party, which Thompson is a member of, was founded in 1959. One of the organizational goals of the communists in America is to “discredit American culture by degrading all form of artistic expression,” according remark read into the Congressional Record, based on a book exposing the communist agenda in the United States. One communist cell was told explicitly to “eliminate all good sculpture from parks and buildings,” replacing it with meaningless and shapeless forms.